Today, I redressed Amber and stored her original outfit safely away. A pretty floral dress, warm cardi, knitted socks and JJ leather shoes and Amber is starting to feel at home here at Sasha Shangri-La. 🙂 A huggable bunny is always nice to have in a new place. The lovely Sylvia with brown eyes and made during the English production in 1966. The lovely Joy with blue eyes and made during the English production in 1966. A view of Amber from the side. HAPPY BIRTHDAY GINGER and what a wonderful gift. Amber is a beauty and it is nice for you to know her history. She looks like a very special doll and Joy and Sylvia look like they will take good care of her until your return from your birthday dinner. What a lovely pressie Ginger, I hope you had a great meal and a super birthday! Very happy birthday wishes to you Ginger. My Amber sends best wishes to your Amber 🙂 She is very beautiful. Of course the three girls look like they are going to be best of friends. Many Happy Returns of the day Ginger!! Sending you lots of good wishes for the coming year!! A very happy birthday again! Hope that you enjoy every minute of your special day. It’s an additional bonus when you know a little bit about their past history too. 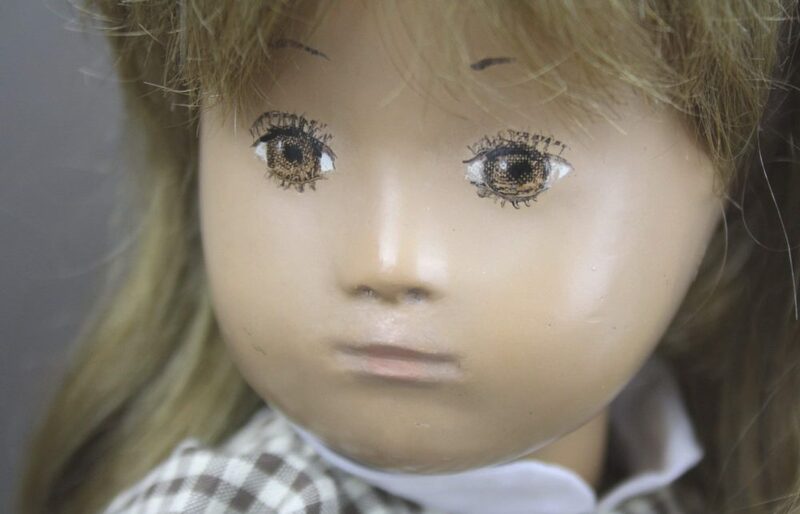 I also have a doll called Amber. I always enjoy visiting your blog and I admit to viewing your posts multiple times on each post. I would love to see your Amber some day soon! Belated Happy Birthday and what a lucky birthday girl you are Ginger! It is fascinating to see the differences between the two Sasha productions in 1966, I prefer the Trendon dolls but don’t tell Amber I said that!